Joshua Romatowski is an active performer on period instruments from the Baroque and Classical era. Joshua believes that to fully understand why the flute is played the way it is in modern times, one must take a step backwards in time and experience what flute players of earlier time periods experienced while performing this music during its conception. Joshua has cultivated a professional level on baroque flute and classical era flute. This study has in turn informed his modern flute performance. Joshua holds an Artist Diploma in Early Music from the Cornish College of the Arts, where he studied baroque flute with baroque and classical flutist Janet See. He has also participated in numerous summer workshops dedicated to the study of historically informed performance practice, and has spent much time working with renowned early music specialists. 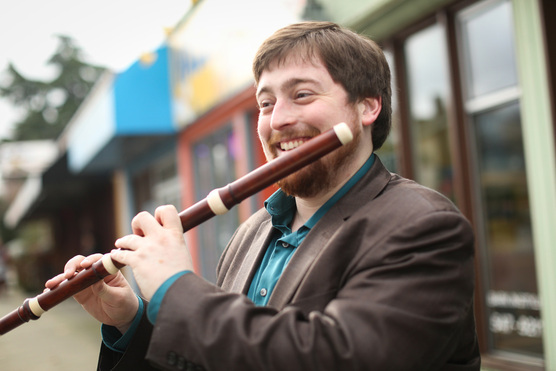 Joshua is in demand as a historical performance practice expert on baroque and classical flute, and performs in various cities on the west coast. Joshua currently performs on a Martin Wenner stained boxwood Carlo Palanca copy from the 1740's. This flute is pitched at 415. Joshua's classical flute is a Martin Wenner ebony August Grenser copy from the 1790's. This simple system flute has 8 keys and is pitched at 430.